Be the first to hear about their new releases and deals. Download the Booksprout app and search for Karen C. Whalen today! Karen C. Whalen is the author of a culinary cozy series, the “dinner club murder mysteries.” The first book in the series tied for First Place in the Suspense Novel category of the 2017 IDA Contest sponsored by Oklahoma Romance Writers of America. Her books are similar to those written by cozy authors Jessica Beck and Joanne Fluke. 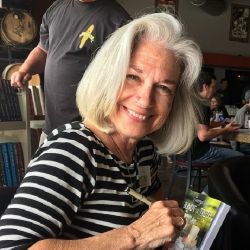 She worked for many years as a paralegal at a law firm in Denver, Colorado and has been a columnist and regular contributor to The National Paralegal Reporter magazine. She loves to host dinner clubs, entertain friends, ride bicycles, hike in the mountains, wear a cowboy hat, and read cozy murder mysteries. She has recently discovered country music and her favorite song is [When was the last time you did something] for the first time by Darius Rucker.